An old system is always replaced by a new and innovative system. Same is happening to education system and colleges. They need to move out of the confines of traditional education system, and warm up to the idea of technology taking them over. It is indeed time for colleges to refurbish their ideas, attitude and style to match the technology and learning needs of the present age and time. 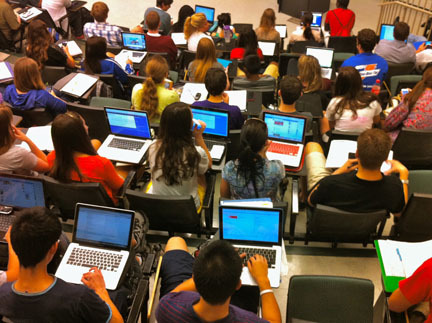 An average college going student spends hours on the computer and internet. It’s time your college understands that getting through to these kids can happen only when they innovate only to involve technology. What will happen if colleges don’t innovate properly and don’t accept technology that aspires to be a part of education? Technology within campuses is going to improve education and make it more versatile. If you adapt to the way the world is moving, you will gain a much better reputation as against staying within the confines of tradition. Wrapped with tradition, you will gain no engagement, no fulfilling factor and ultimately no student satisfaction either. What Students are Looking for? Innovation is the key to understanding what your students need from your college. For example a traditional college has good teachers but what good is a teacher if he/she cannot adapt to the new brewing technologies? If the teacher cannot engage the student in a way they want to gain engagement, or are not present on the platform the students are present then they are not really doing improving their educational presence. A lot of colleges have understood how students behave, and how distracted they stay. Instead of calling smartphones an accessory that distracts them, some colleges have harnessed the potential of smartphones to engage their students. What does it mean to innovate your college in the tech era? It simply means you need to rope in technology, make learning holistic, and give importance to learning. So, a good learning management system along with motivated teachers will be great for your college. If you don’t engage in these factors, and pay attention to teaching and getting those high grades and percentages, then you are sure going to die soon. Students are no longer looking at education for a job or for grades; they are looking at education to learn something new, and enhance their skills. Colleges will need to look at the goals of these students to improve their own performance. VClassrooming is a integrated learning management and enterprise resource planning software for School / College ERP software. Packed with tons of in-depth module like payroll, self paced learning, courses, fees etc it aims to equip you with tools to create a truly digital campus.